The tank is molded with a thread. This is used to attach a cap to the tank. Nylon threaded vented cap with mechanical gauge and screw on breather. 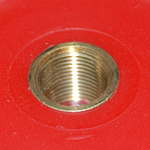 The vennted cap with gauge is manufactured the suit the 2 1/4″ thread. The vented cap with mechanical gauge is fitted with a breather that screws in and out as desired for optimal air flow. The gauge has a float on a metal rod to advise how much fuel is in the tank. A brass tail is supplied with the pick up. The tail fits a 3/8″ hose.